More refugees from the Syrian conflict will be resettled in the UK over the coming years with the launch of Sponsor Refugees, a foundation recently set up by Citizens UK to boost the community sponsorship of refugees. Sponsor Refugees will advise and support faith and community groups who take on the responsibility of raising funds, finding a home and then welcoming and settling refugee families in their neighbourhoods. 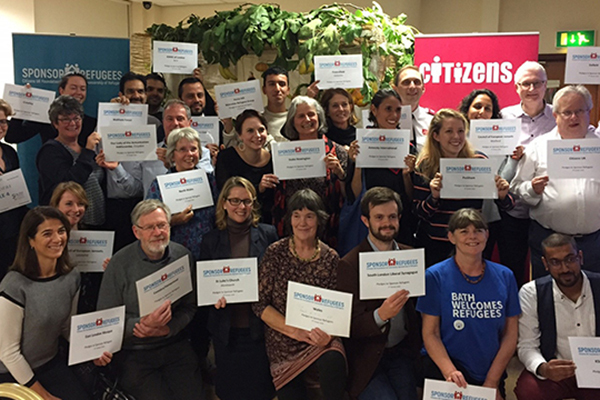 Community sponsorship of refugees was launched by the Home Secretary, Amber Rudd, in 2016 at Lambeth Palace, and since then groups from Bude in Cornwall to Flixton in Greater Manchester, from Hackney in East London to Fishguard in West Wales, have successfully been pioneering the scheme. The launch of Sponsor Refugees is set to boost the scheme, with more than 30 pledges from citizens, church groups and even businesses, to carry forward community sponsorships across the country made at the Sponsor Refugees launch event in October. Lambeth Palace were also the first sponsorship group in the country, with Archbishop Justin Welby housing the family in an empty property on the palace grounds in 2016. Now Muslim and Jewish groups are also taking up community sponsorship, alongside the different Christian denominations and non-faith community groups. Community Sponsorship is based on a successful Canadian scheme where churches, mosques, synagogues and community groups have welcomed and supported 300,000 refugees since 1979.